CULTURE OF REVOLUTION · Intentional Destruction Throw away your best ideas PETER LYNCH IS AN AWARD-WINNING documentary director. 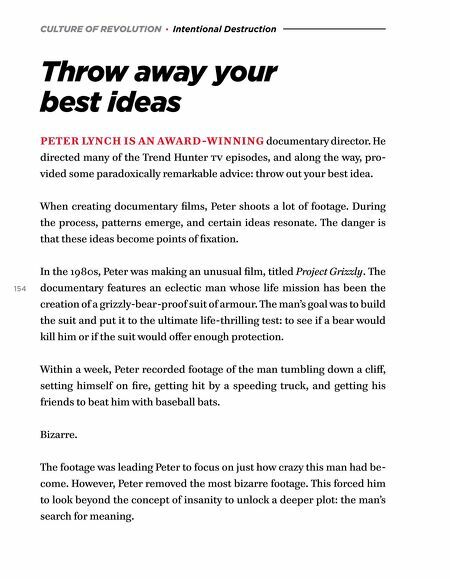 He directed many of the Trend Hunter tv episodes, and along the way, pro- vided some paradoxically remarkable advice: throw out your best idea. When creating documentary films, Peter shoots a lot of footage. During the process, patterns emerge, and certain ideas resonate. 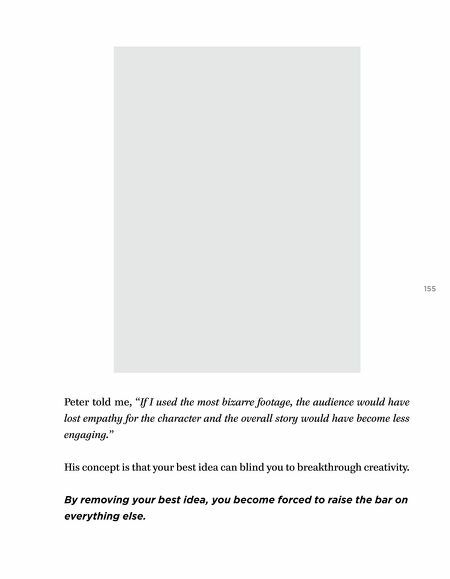 The danger is that these ideas become points of fixation. 154 In the 1980s, Peter was making an unusual film, titled Project Grizzly. The documentary features an eclectic man whose life mission has been the creation of a grizzly-bear-proof suit of armour. The man's goal was to build the suit and put it to the ultimate life-thrilling test: to see if a bear would kill him or if the suit would offer enough protection. Within a week, Peter recorded footage of the man tumbling down a cliff, setting himself on fire, getting hit by a speeding truck, and getting his friends to beat him with baseball bats. Bizarre. The footage was leading Peter to focus on just how crazy this man had be- come. However, Peter removed the most bizarre footage. This forced him to look beyond the concept of insanity to unlock a deeper plot: the man's search for meaning.